Ventura- 2:34:something Granted there were other issues too, but I walked from mile 6.5 on. I also felt broken at the end- I almost couldn’t walk back to the hotel. 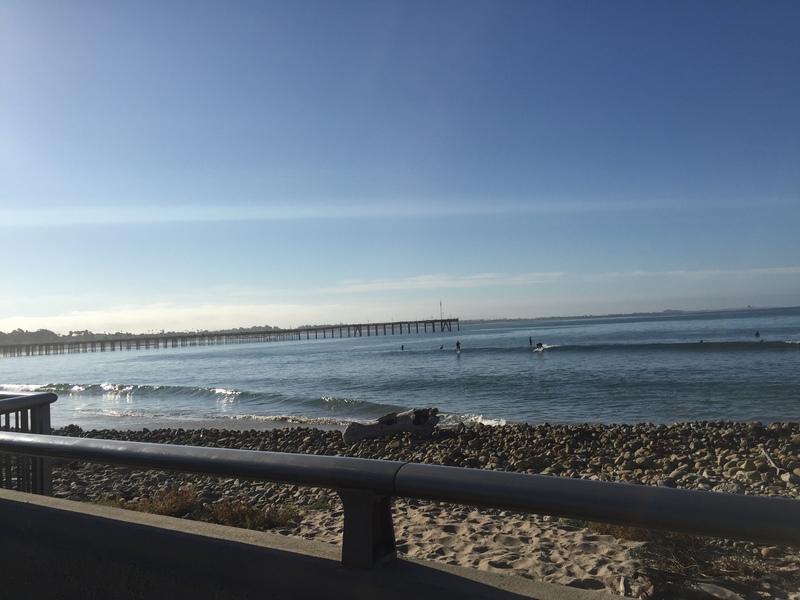 Surf City– 2:19- 95% humidity? Seriously? So of course, I head back to Ventura for more pain fun. Different course but 85% humidity at the start. I tried not to look but have finally learned I need to be prepared. I was aiming to run a comfortable race and finish around 2:15. I don’t know about you but humidity is never comfortable. So here we go. After 4 hours of sleep I was up at 3. I had limited my carb intake since Friday and eaten less than normal pre-race on Saturday. I did this for Wine Country and it worked well so I tried it again. We were on the road by 4:15. My mom drove so I dozed off and on along the way. We arrived 30 minutes before packet pickup so headed to a nearby McDonald’s to use the restrooms and she and S had breakfast. That place was sketchy. Parking was easy and we headed out to the start. Packet pickup was actually easy. I think I had birthday luck and got everywhere before lines formed. I had good port-a-potty luck too. 🙂 Exited one to find about 60 people in line. They had a map of the course up and announcer going over it. There were pacers for every 15 minutes starting at 1:30. The start was self seeded with 4 waves- Sub 8, 8:00, 9:00 and 10:00+. In keeping with my plan to run a 2:15, I lined up with that last group. Here’s where I had to contain my inner fan girl. Earlier while hanging in the grassy area with my mom and S, a man walked past up wearing a McFarland singlet. I pointed him out to my mom and wondered if it was real or just something they sold in association with the movie. I then forgot about it as we headed to the start line. The corral at the start was very tightly spaced and I looked right then snapped my head back. 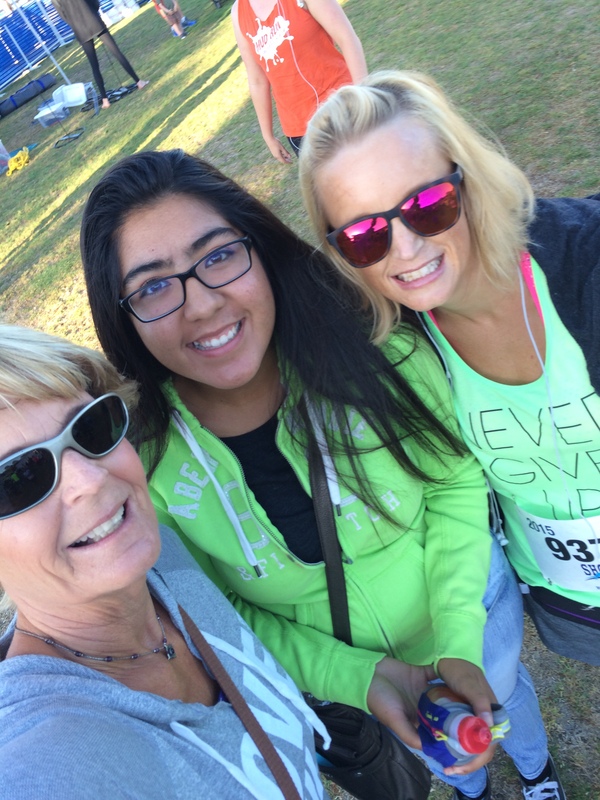 The flippin’ McFarland running team was standing there! At least part of it. Say what!? They soon squeezed their way through to the sub 8 group. Then the gun sounded and we were off. So much for lining up with the 10:00+ pace group. I went out too fast!! The race has 3 or so miles on the boardwalk- at the start and end. 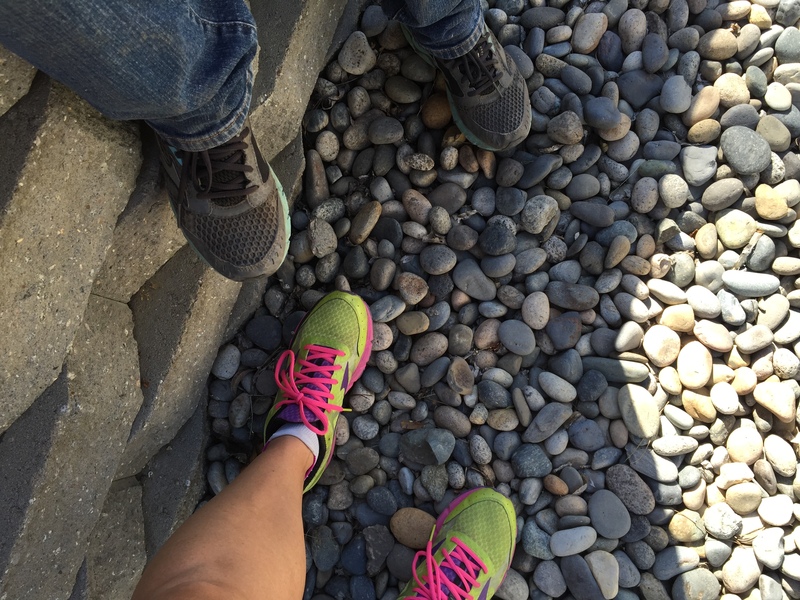 This meant amazing scenic ocean views, but it also meant running on concrete. My left leg was pissed early on. Nothing alarming, I just knew I needed to shake it out. We switched to black top by the end of mile 1. I shook off the pain by mile 3. The next miles alternated between a black top bike path and busy roadside. I was feeling pretty good but I also realized I was going to positive split this race in a big way. There was a tiny incline for miles 5 and 6 and I loved it. It made my legs happy. 🙂 Nasty looking dumpster aside, the course scenery was still awesome. It was a clear, sunny day and the ocean looked amazing. It was high 60’s, low 70’s which normally I would love but I could tell the humidity was getting to me. It was no longer a question of if but when. We hit the turn around for this section a little past mile 5. Now I knew what I was getting on the way back so I was ready. The course leaders had also flown by when I was around mile 4- they were flying! I was pacing myself by following a tall man in front of me. I did that for about 4 miles before I passed him. I had graduated to walking all the water stops. I would drink half the water and dump the rest on my head or down my back. I was so sweaty, it was hard to tell the difference. Heading back to the boardwalk something funny happened- the arms at the train crossing came down! I saw everyone ahead stopped but I didn’t want to stand still and wait so I slowed to a walk hoping the train would come through before I got there. They lifted without a train ever coming through- what? Then we were back on the board walk. This is where things got dicey. The boardwalk wasn’t closed so we were dodging walkers, non-racing runners, bikers, surfers, dogs, etc. That took so much more energy, mental and physical, than I had. One woman got off of her bike and parked it horizontal across the path. I swear she looked at us racers like “deal with it” but that could have been the fatigue making things up in my head. Another hard part of mile 11? Running past the finish line. We had to run past the finish/ start area to head the other direction for a 2+ mile loop before the finish. Grrr. And my lungs protested again. Once more I slowed to use my inhaler. I had troubles getting started after that. I knew I was so close to the finish but I was hot and tired. I was so sweaty, the shorties under my skirt started sliding- they have never done that. I took more than a few walk breaks those last 2 miles. Then it was back on the board walk for the final push to the finish- dodging people all the while. Somehow I mustered up energy for a final kick to the finish. We were given our medals and herded into the grassy registration area. This is where my only real race gripe came about. The race promised tacos and beer at the finish line. Which were there but all I wanted was water. I could not find a freakin’ water table! I looked everywhere, even my mom and S couldn’t find one when they met up with me. 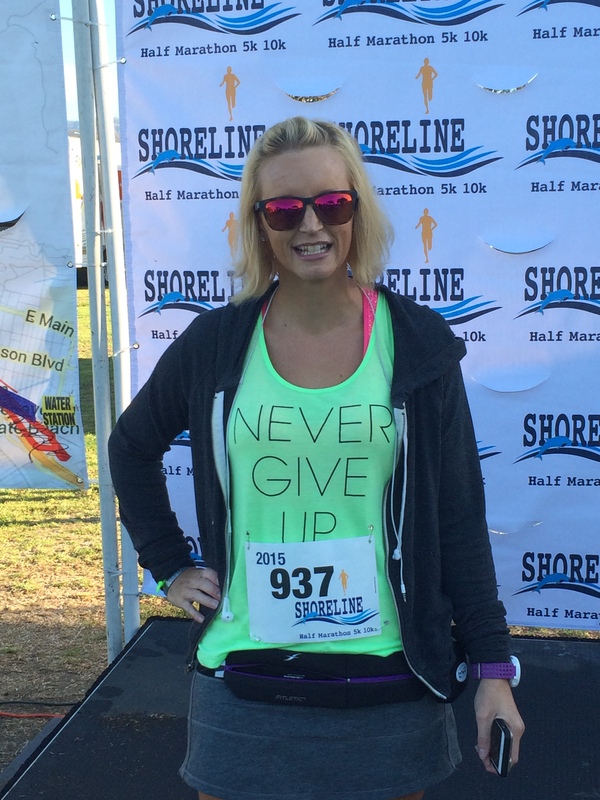 I had read about other bloggers having this issue at races but had never experienced it. I was so hot and sweaty and I just wanted to cool down. I took off my shoes and belt and passed them to my mom. I went down the beach, climbed over the rocks and walked right into the ocean. I heard her yell that I had paid a lot of money for the socks I was now walking the beach in. 🙂 It was seriously amazing. If I didn’t have my bib or my Garmin on I may have just sat down in the water. I hung out there for a bit before heading down the beach to the stairs back to the boardwalk. I didn’t trust myself negotiating the rocks the a second time. How do you celebrate your birthday? I’ve yet to have any cake! Ever had to dodge the public while running a race? When too tired for miles, Mizuno make great yard work shoes. Sunday though was going to happen. Last longish run before SLO. My training plan called for a 75 minute 2/3 progression run, each third progressively faster. 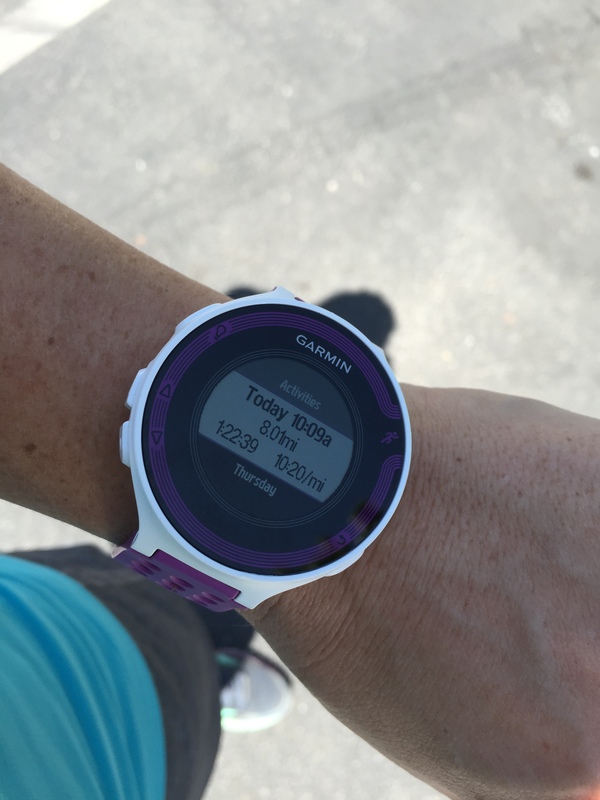 On race days, 75 minutes could mean 8 miles, however on long run days, that would be more like 7. Having not run on Saturday, I was internally hoping for 9 at an easy pace. 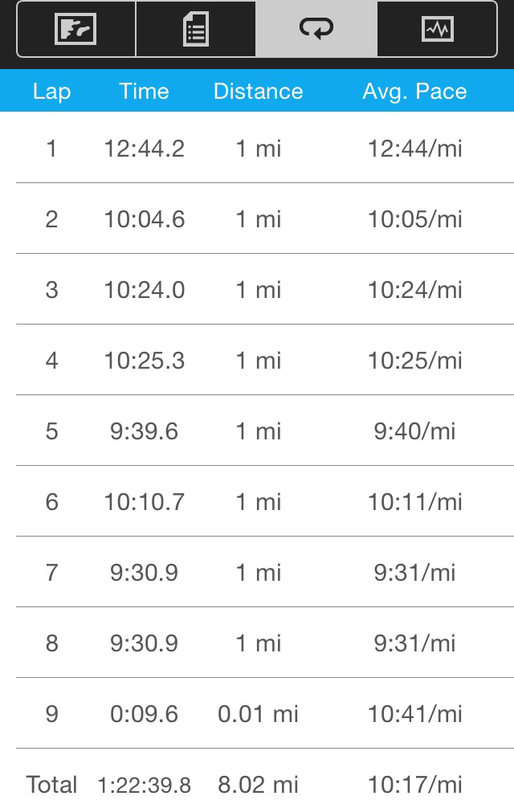 Since I know the likelihood of breaking 2:00 this weekend is small, I was fine with longer, slower miles. I was a little sore from the rocks, oops, so I headed to the lake path for a flat surface. I headed out before lunch!! Who am I? 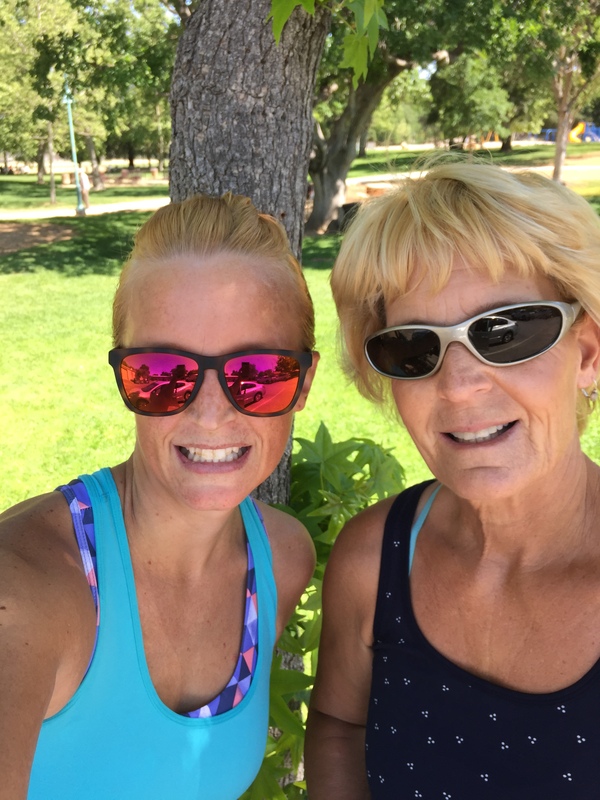 My mom came with me, she was going to walk laps of the lake while I was running. I walked my usual warm up and just got to running. I didn’t feel up to the 2/3 plan but I thought maybe I could run the first have around 10:45 and the last half around 10:00. That sounded like a solid plan to me. That’s what I thought I could do, I was wrong. But in a good way for once! I didn’t feel like I was moving faster but according to my splits I was. I’m not sure how I hit those when I was feeling super tired but no complaints from me! Mile 6 was a little slower as I had run into my mother again and walked a bit with her. At that point, she was planning on only one more lap and I was torn between 2 or 3 more miles. It was a warmer day than planned so I decided to be smart and call it at 8 miles. It was in the 70’s by the time we were done. Last longish run done! Bring on the taper- oh wait, my plan doesn’t have one! It’s crunch time for the race now, so I set out on Sunday in a potential race day outfit. I had purchased a new skirt at Lululemon the week before so I wanted to test it out. SLO has a Lululemon now, well kind of, it’s only open 3 days a week, and my first time there cost me some money. 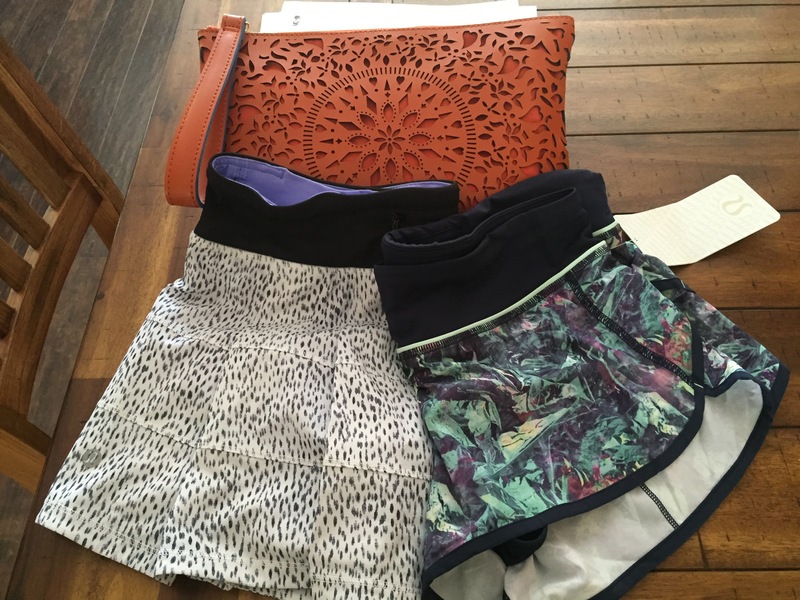 I love their shorts so I bought a new pair and a skirt. Oops! I think I am a skirt fan now. If I could have an unlimited budget at Skirt Sports and Lulu, that would be awesome. Well, there and Mizuno too. 🙂 Endless shoes and skirts!! Over all the outfit worked well. I am still not sold on the shirt and I will be wearing full compression socks but the skirt is a go. It turned out to be super comfy for 8 miles and that was without any Body Glide. I figured that was the only way to figure where the hot spots might be. 🙂 Since my mom was with me, I asked her to take a pic. 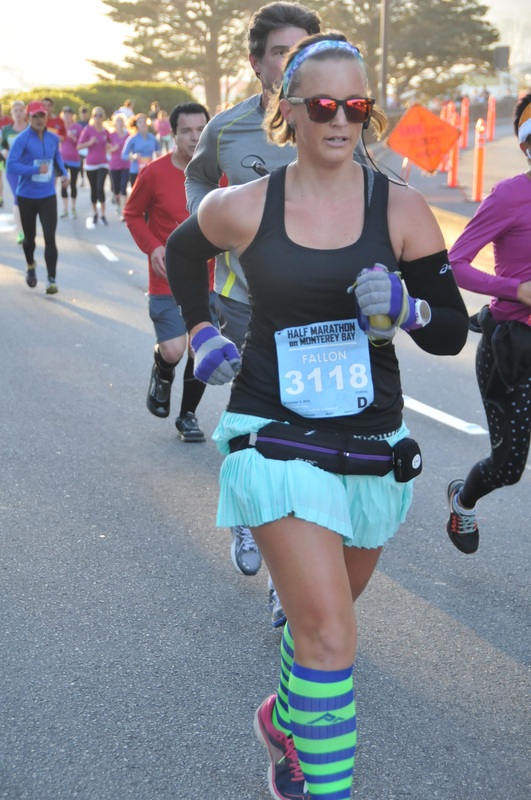 I think another goal of 2015 is to finally get a decent race pic. Seriously, the pics from Surf City and Wine Country were so bad. So bad. Actually breaking 2:00 might be easier than a good race pic. Ha! My sock tan makes me laugh. 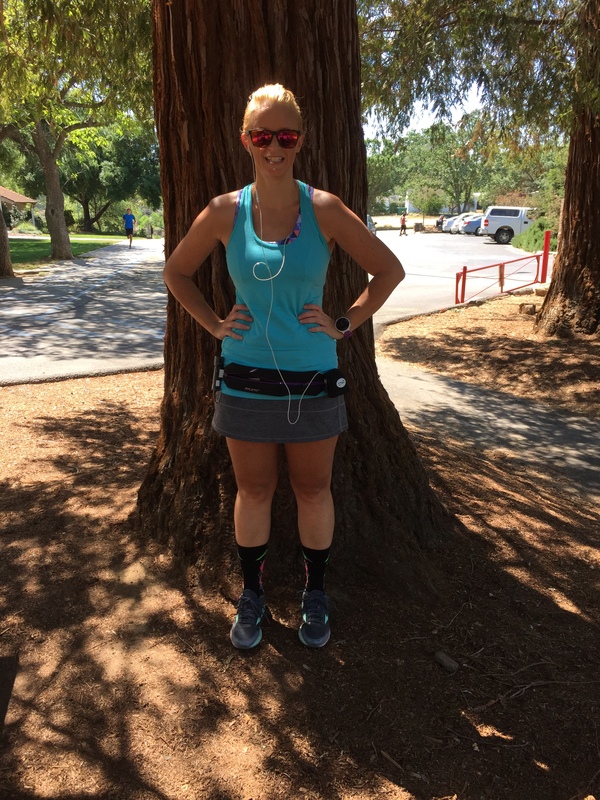 I don’t wear full compression socks that often, just long runs and races but check that out! Does moving rocks count as cross training? What do you like to race in? Do you take good pictures?